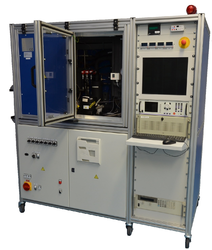 Our range of products include fuel cell evaluation test equipment, automatic compressor performance test apparatus and full automatic compressor performance testing equipment. Current Setting 3-range,+-0.3% of F.S. Mixed gas with optional mixing ratio can be produced by setting total volume and mixing ratio of each gas. Cell is protected by over-flow protection function. Various options including pressure test, humidity measurement, etc. Automatic operation by exclusive control software (CISAS-EX) for controlling of parameters such as gas flow, bubbler temperature, pipe temperature control, load current, etc. The software changes process conditions by sequencing numbers of sheets writing test. After judgment of stability, it automatically collect data. Electronic load (several hundred W to several hundred kW) As a bias power supply corresponding to 0V, it can be used in a single cell. 3 ranges of current settings, high accuracy of ±0.3% of F.S. 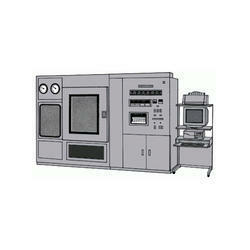 This apparatus is a fully automatic compressor performance test equipment that automatically measures the refrigeration capacity of an air conditioner compressor to be installed in a car. 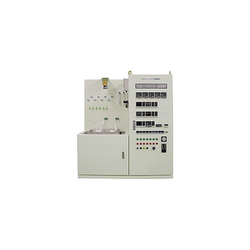 The equipment is a full automatic compressor performance testing equipment for measurement of refrigerating capacity of compressors for vehicle-installed air-conditioners. Total refrigerating capacity of compressor, net refrigerating capacity, shaft power horse, coefficient of performance, volume efficiently, mechanical efficiency, etc. Computation of total refrigerating capacity of compressor, net refrigerating capacity, shaft power horse, coefficient of performance, etc. Automatic processing from control/measurement of compressors to capacity computation/data output. Short measuring time by control stability and quick computation. Highly accurate capacity measurement by precise measurement and computation system. Excellent reproducibility and easy comparison of capacity of prototypes.